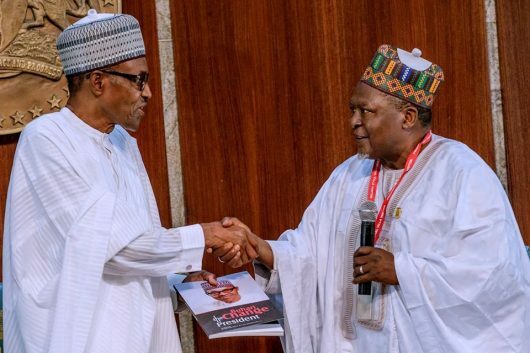 Alhaji Umaru Dembo is a former Minister of Petroleum, and Director General of the Buhari Support Group Centre (BSGC), in this interview with Ayodele Samuel, explains that only selfish old allies of President Buhari are against him. You are one of the strong allied of Mr. President and as a matter of fact during his declaration in 2014 you said the opening prayer at the eagles square, that shows how in-depth you’ve been with him, all of a sudden a lot of Mr. President old friends are in his opposition, what will you say about this? Everybody has his own plans, likes and dislikes and in life two people cannot be exactly the same even if they are twins. What has happened I think is that we worked with Mr. President at a certain stage and certainly he became the president and a lot of us are simple, humble and we are waiting to be call upon for one thing or another. But while we while doing that we are forgotten that in leadership or in position of statesmanship, is that you have to act quickly or else some people will go before you and once they are ahead of you they will never allow you to come near. So, what happened actually was that some people after he won took over and were very close to Mr. president and since they were there before us they didn’t want anyone who had been with him for a long time to come near. It seems it is presidency, you can lockout people and they have lockout most of the president men before elections in 2015 and they became the president men after election. It is not unusual, it has happened to us and we have seen it. It now depend on individual to know whether it is a matter of do or die to be one of the president men or to continue to be working for the good of Nigeria in their indeeds of the government as headed by president Buhari. Some of us choose to continue because we believe everything is from Allah. If you get it is God that gives you, if you don’t get it it means you’re not destiny to get it, so why worried. We will continue to work, sow and cooperate whether Mr. president men or not and others who have not patience but felt they should be rewarded by man, they started talking and later, they’ve made moves to leave the party and it’s equally not unusual because that is human beings for you. Are you not worried that the new men around Mr. President are probably not too in-depth to the ideology of President Muhammadu Buhari, and this as maybe in one way or the other handicapped the President performance in terms of governance? Well, you see nobody is perfect and if you are not alone in the business and definitely Mr. President cannot be alone in his actions. The most important thing is- is he achieving something or nothing? No matter what anybody thinks, no matter how bad you think of Mr. President he has achieved a lot of things in terms of security, infrastructures, agriculture, welfares for the people, schools, the railways, airlines and so many things that he has achieved despite the difficulties on his way. I know lot of people who are from the old ruling PDP in his government but they have not being able to stop him because his main goal is there. He has kept it and his pursuing it whether some people make it easy or difficult to achieve his goal is a different thing but he’s achieving. With these he has the credit of one President that can be re-elected. You have roll out machineries to ensure Mr. President is re-elected in 2019, are you not worried about the Coalition of United Political Parties, CUPP; are you not worried about the alliance of close allied of Mr. President who supported him in 2015 coming together with opposition to fight him in 2019? What are your worries about 2019 elections? Whether there are close allied who defected, whether there are those who left the party and join another one, the president and the party and the support groups have to work hard to get him elected. It’s a challenge, and the more challenges you have, the better prepared you are. Even if he has no people around Mr. President or no close allied talking from both sides of their mouth and talking all sort of things, and people defecting then we would have sit down and relax, thinking that everything is well and that we don’t have to put more efforts in the deployment of our resources and energy in getting him re-elected. But now with all this problems, we have started working very hard to ensure that we have in place the all it will takes for Mr. President to win again. A lot of issues against Mr. President is that he has not been able to fulfill most of his campaign promises, particularly his party’s promise to restructure Nigeria, what is your take on this? Everybody wants his own portion of the promises fulfilled but no President has done enough or as much as President Buhari on the performance of party promises. He has done very well. For those who want restructuring is a different thing, because restructuring is not a easy thing and it is not his only promise, maybe it is the least of his priorities, maybe it is the best for others who knows. But if you count the promises he made, by regions it is not all that can be fulfilled. If you have a good percentage then you are through. What is the stand of President Buhari’s credibility to win election in 2019, there is this fear that he has lost a lot of grounds particularly from his followers in the north. How true is this? It is not true. It is people who think they can deceive others to follow them. He has not lost anything. Everywhere you can notice, anywhere he steps out. Even me as the DG support group, everyday, I got phone calls, texts, emails from people who wants to join our support group and want to know what to do for Mr. President. Even in other parts of the country, there are so many groups of individuals who are looking for what to do to support Mr. President’s re-election. He has done many things, the roads, the 2nd Niger bridge, some many lanes from Lagos to Ibadan, Abuja to Kano, Kano to Maiduguri, the railway line from Ajaokuta to Warri. Some many things this man has done, what are people looking for? Human beings are not considerate at all. If is some people who will do the wrong things for them and give them cash, they will be praising them. But this man is not like that, he want people to enjoy their lives and even the yet unborn children to be comfortable and enjoy the lives in the country. Let’s come to the issue of ethnicity, one of the issues against Mr. President is that his favouring his kinsmen in appointment and also the issue of Fulani herdsmen and he has appointed his security chiefs from a particular session of the country, and referring you back to Senator Bukola Saraki’s letter stating that all good projects goes to Kastina. What’s your reaction to this? Bukola Saraki was being mischievous. He’s a Yoruba and because most of the lucrative activities, most of the budget for the all the years as gone to the South West, the important positions as gone to the South West and the yorubas. So, why is he saying that is going to the Fulani, it is not true. Everybody knows in Nigeria people just keep quiet, the Vice President is there, when are the President goes on leave or out of town the Vice President act, do whatever they like and present budget for money spent in this area at the detriment of other part of the country but we don’t want to say anything from the north because the president is ours. All the lucrative places are not for the north, what do security chiefs do compare to the ministry of finance. Ministry of transport, places where cash flow and projects going are not for the North not to talk of Kastina. I am sure if he is the president he will do what is accusing Buhari of doing. Now, let’s come to the Buhari supporting Group Center, what should Nigerian be expecting from the group ahead of 2019 election? We have mobilized thousands of people across the country who truly wants this project to salvage Nigeria to continue, the 16 years of the PDP has caused alots of damaged to Nigeria and our vision is to make sure Me President is re-elected. He has the people behind him, we are mobilizing their support for him.